A solid update - the new and updated audio manipulation features could well come to render third-party tools obsolete. VariAudio 3: great update to the existing audio manipulation tool, with features that improve sound and useability. Audio Alignment has the potential to be an excellent tool. The floating right-click toolbar is now fixed-size and trickier to use. As Steinberg’s announcement of the impending arrival of Cubase 10 landed in our inbox, the usual ‘update buzz’ was somewhat quelled by the momentary thought that we had been using Cubase (in its audio-capable form) for more than 20 years. We then went more misty-eyed at the memories of MIDI-only Cubase running on an Atari ST. Gazing into the technological future is always a dangerous game, but we did then ponder what our Cubase feature request list might have looked like 20 years ago, and whether it had any resemblance to Steinberg’s latest version of it’s long-established DAW. Steinberg has a recognisable release pattern, so the official Cubase forum had been humming with the sound of predictions, praise and damnation well before Cubase 10 had been observed in the flesh. After its arrival, the forum has seen further raised levels of fury, followed by calmer countering voices suggesting that the current update is not in fact the end of civilisation. So, all in all, it’s just another day in the online world of some Cubase users, but also a pointer to the general response of the keenest upgraders. Opening Cubase 10 for the first time the overall feel is one of familiarity, though on closer inspection icons and windows feel noticeably cleaner. It is apparent that the Steinberg designers are aiming for a flatter, more modern look and this is definitely a good move in many respects. However, there remain some areas of the interface (most noticeably the MixConsole windows) where the customisable scaling and graduated colour boxes still lack the crispness of some other DAWs, such as Logic 10.4. Font clarity also seems to be variable, and a potential problem when light-coloured and/or small text is used. We wonder also if colour could be employed more often in some of toolbar buttons. Overall though, and after some tweaking, we found the C10 approach broadly to my liking. Cubase also now caters for Retina and HiDPI displays, though third-party plugins need to be designed with this in mind. Mac users are the ones likely to find this more useful from the off, and there may be some scaling issues in multimonitor setups, but this move does bode well for the future. While there are many areas of the redesign that are functionally benign (like the smartened-up built-in plugins), there are others that may take adjustment. Dialogue windows, like those for Audio Export and Project Setup and Project Sync have been rearranged (and with ability to hide elements) and the ChannelStrip has been tweaked. While small, the changes in the strip do indeed make it more useable. The most immediate adjustment, however, comes in the form of the right-click toolbar and menus. Previously, it was possible to rearrange the grid dimensions of the tools that pop up when right-clicking. Now they are fixed in a straight horizontal line, which makes selection less speedy. Many users will have this engrained in their workflow, and any changes represent a real annoyance. Sometimes it’s the small things! Upgraders will also notice that the dropdown menus (when Ctrl+ right-clicking), are now fully context-sensitive (rather than offering all possible menu options). This streamlining is a good idea, though it may irritate those who are used to this way of working. It’s worth pointing out that if you are upgrading from a previous version of Cubase, each full or half-step iteration gets its own installation folder and associated setup/preference files. However, most configuration choices are copied to the new version, making the transition relatively seamless. The C10 licence also give you access to previous versions, so if you are nervous about making the transition, it’s possible to stick to using the latest version only for new tracks. We did crash out of Cubase 10 a few times when exporting audio from some tracks started in C9.5, but largely the process went pretty well. Let’s look at some more significant changes and additions. The one that most caught our attention was the new Audio Alignment function. Anyone who has had to line up and tighten multiple vocal takes will know that anything to make the process easier is a real time-saver. Up until now third-party tools such as VocALign/Revoice Pro have helped, but require audio to be transferred between programmes. Steinberg has come to the rescue in C10, and using it requires little more than dragging two pieces of audio into the new Audio Alignment panel. There are various processing options, and adjustable precision, but once set, everything happens with a single-button click. We must admit that our initial excitement was tempered by the variability of results. Barring the creation of odd pitch changes, which were tracked down to an incorrectly-set audio algorithm, I did find some of the results acceptable. However, better results could be achieved using conventional, but long-winded, editing techniques. We suspect that Steinberg will tweak this feature in response to user feedback, but at the moment it doesn’t quite feel 100% ready for the big time. Audio manipulation has also seen significant enhancements with the move to VariAudio 3. Previously, Cubase offered decent pitch-editing capabilities, though it lacked finesse when dealing with trickier source material. VariAudio 3 redesigns things to make the process much quicker. No longer do you need to switch between slicing and adjustment modes or keep moving from event to parameter sliders to make changes. Smart Controls (small box and triangles surrounding an audio event) now allow you to edit everything in situ. Even better is the ability to alter where the pitch correction should begin and end for each note. This allows natural slides to remain in place, and improves the results greatly. There is also a lot of fun to be had by editing the formants of each note in a sequence for odd special effects. It is also now possible to overlay a MIDI track in the editor for better note/pitch referencing. For those who mainly use third-party plugins or content, it’s easy to overlook what actually comes bundled with your DAW. Under Apple’s ownership, Logic began to be bundled with a huge selection of loops, presets and instruments. 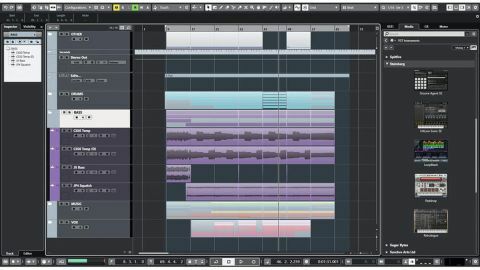 Cubase was slightly later to the game, but now has a solid line-up that includes HALion Sonic SE and Groove Agent SE alongside various synths, effects and audio loops. HALion Sonic began as a sample playback instrument, but has since evolved to include synthesis elements, which have been handed down to its cut-down ‘SE’ sibling bundled with Cubase. Similarly, Groove Agent SE has seen its feature set grow over the years, and with an ever-expanding library of bundled content straddling both electronic and acoustic styles. Cubase 10, and the arrival of GA SE 5, brings more content (including the Laser Beam set), but also adds some features. The number of velocity layers has increased, alongside more individual outputs and an improved file browser, that makes preset and content selection easier. The big winner here though, is a resizeable plugin window. Sticking with audio editing, Hitpoint detection has also been tweaked for better results with non-percussive material. Interestingly, Steinberg have announced that ARA 2 will be coming to Cubase in 2019, which will allow for much better integration with Melodyne and others. However, as things stand, you may now choose to stick with VariAudio 3! The Cubase mixers also get a boost in C10, with the arrival of Snapshots, which allows you to store and recall mixer channel settings for all channels. Recall can also be enabled for selected tracks only, and for specific parts of the mixer (Inserts, EQ etc.) Simple, effective and very useful. We are still waiting, however, for a way to be able to globally save mixer setups (ie Configurations with all channel/fader sizing info). There also remain graphical issues when resizing the fader area which perhaps result from having too much choice. A small, but useful, addition here, though, is the ability to display each channel’s latency in the mixer, though it is not updated when Contain Delay Compensation is engaged. Side-chaining is now more intuitive, with setup all done from the destination side - though better implementation might have caused less potential impact on Effect Send layouts. Other additions include MPE controller support, AAF Import/Export (for moving audio session between DAWs/editing systems), 64-bit floating-point recording and export, 20 new ‘vintage’ reverb impulses for Reverence, Groove Agent SE, more loops and sound content, a new distortion plugin (‘Distroyer’), the ability to employ effects chains and ‘favourites’ when Direct Processing audio, better Chord Pad config, Ambisonics support (part of the Steinberg VR production suite, and very interesting for game audio creators) plus the addition of the excellent SoX algorithm when resampling. Also, drag and drop functionality for effects and instruments has been added in the Media Rack (including the ability to add customisable plugin images). A decent list when taken together. Despite some niggles, we are broadly positive about this update, though, with any audio software, it’s worth waiting a while before making the full switch. The graphical changes are well-considered and some functional changes have the potential to be extremely time-saving. Overall, this update has some excellent elements, though how useful they are will be highly dependent on how you work – one of the problems of a long-running DAW heritage. One user’s ‘must have’ is another’s pointless addition. We suspect there’ll be some tweaking by Steinberg before the next update to accommodate community feedback, though new users should find most things to their satisfaction. If some of the rough edges can be fixed, version 10 should be a worthy successor to the line.